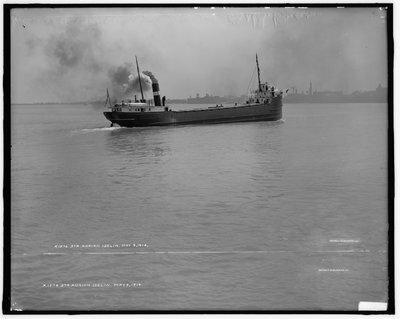 The George Hall Coal and Trading Company canaller ADRIAN ISELIN in the Detroit River immediately before her delivery voyage to Ogdensburg, NY. In the background to the right is the Hiram Walker distillery. Over her deck in the background are the twin spires of Holy Rosary Church, Walkerville, ON.